In 2016, we set a goal to reduce greenhouse gas emissions (GHGs) from our offices, data centers and small vehicle fleet (otherwise known as scope 1 and 2 emissions) by 30 percent by 2025. By focusing investments on energy conservation and more efficient use of space, Symantec achieved a 32 percent reduction in just three years, surpassing our goal seven years early. Building on our success, we are participating in the Science Based Targets initiative (SBTi). The SBTi, a collaboration between CDP (formerly the Carbon Disclosure Project), the UN Global Compact, World Resources Institute, and the World Wildlife Fund, champions science-based target setting as a powerful way of boosting companies’ competitive advantage in the transition to the low-carbon economy. SBTi has found that setting science-based targets increases innovation, reduces regulatory uncertainty, strengthens investor confidence, and improves profitability and competitiveness. Science-based goals are considered ambitious in that they align with the levels of emissions reduction scientists tell us are required to avoid the worst effects of climate change. We are proud that Symantec is one of the 186 companies who have received approval by SBTi against their stringent criteria for corporate GHG goal setting. 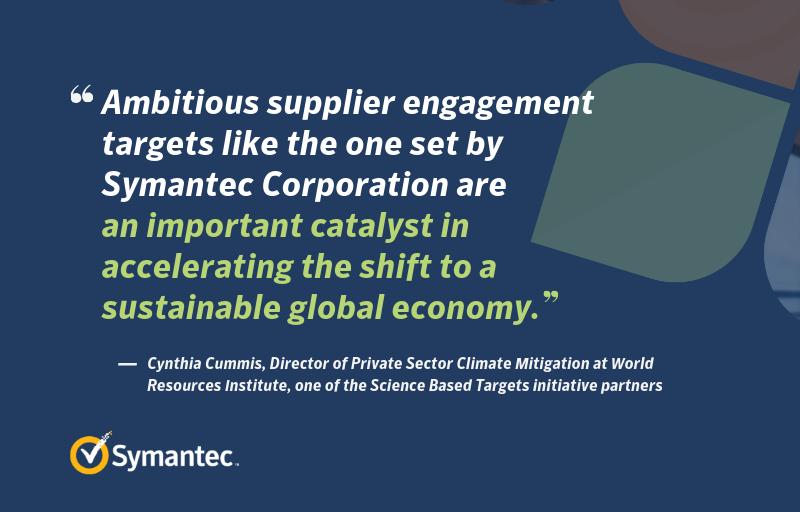 One of Symantec’s new, SBTI-approved goals is to reduce our scope 1 and 2 GHG emissions by a further 30 percent over the next 15 years (FY18 to FY33). With the emissions reductions we've achieved already and our new 30 percent reduction goal, our targeted emissions in FY33 will be a whopping 60 percent lower than in FY11.